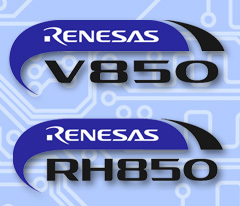 Renesas' popular V850 and RH850 family include automotive-specific MCUs, motor control ASSP, and general industrial MCUs, targeted at low-power, high-performance applications. The Green Hills Optimizing Compilers for V850 and RH850 all use a common code generator with architecture-specific optimizations. Some optimizations include loop optimizations, peephole optimizations, register coalescing, tail recursion, and memory optimization. As an additional benefit, Green Hills offers CodeFactor®, a link-time optimization which reduces overall program size by identifying and removing redundant segments of code from object files. Processor—One option for each supported V850 and RH850 model. This setting determines the instructions permitted, as well as the pipeline optimization strategy used. Reserve registers for the user—The compiler can reserve various registers (r2, r5, r15-r24 or r17-r22) for the user. Position Independent Code (PIC) and Data (PID)—Allows code and data to be placed anywhere in memory and still run correctly. Far function calls—Linker can automatically detect function calls that are out of range and insert code to resolve these calls. Gsrec conversion utility—Converts an executable file into a Motorola S-Record format file. FPU Support—Generates code to use the Floating Point Unit (FPU) for the V850E1F (V850E/PH2 and V850E/PH3) and RH850 families or the V850E2R. 64-bit Integers—Supports 64-bit data types, constants, and expressions including double precision floating point. Ghexfile Conversion Utility—Allows conversion of an executable to hexadecimal. Automatically determines byte order and BCS/COFF based on header information. Normal data: The default memory model, where all data is placed within the data area and is accessed using normal load and store operations. Small data: Data is assigned either automatically by the compiler or manually by the user (or both) into a small data area and is referenced using a reserved register as a base pointer, allowing for smaller code for data accesses. Zero data: Similar to Small data, although the zero register (r0) is used as the base register to access data within 16 bits of address 0. Tiny data: Data is assigned by the user into small sections accessed using the Tiny Data Area (TDA) base register (ep) and the V850 short load/store operations providing for the smallest possible code for data accesses. The compiler supports multiple Tiny Data Areas and can switch between them dynamically at run time. CodeFactor Linker Optimization—A link-time optimization that reduces overall program size by identifying and removing redundant segments of code. Highly configurable—Many processor extensions and features (callt, prepare/dispose, etc) can be selectively enabled or disabled in the compiler, with full support provided in the Green Hills libraries. A comprehensive suite of run-time libraries for C, C++, and EC++ are included in the corresponding compiler distributions for each language. Several different versions of the libraries are provided to accommodate different combinations of processor and memory models. The combinations include hardware vs. software floating point, and CPU specific versions. Full featured start-up code and libraries include automatic copy of data from ROM to RAM and system call emulation. Green Hills has incorporated the MISRA C guidelines for C programming into MULTI and its optimizing compilers. MULTI’s MISRA C support enables developers to easily select the MISRA rules to automatically enforce, resulting in cleaner code and fewer bugs. At compiler time, violations of MISRA C rules are reported. Violations that can only be detected at runtime are automatically detected and reported by Green Hills Software’s advanced run-time error detection. MULTI supports MISRA C 1999 and 2004. 850eserv2—Supports a wide variety of In-Circuit Emulators from Renesas. Full support is included for the built-in instruction and data trace capabilities, which is fully integrated with the TimeMachine Debugging Suite. rteserv2—Supports a wide variety of boards and In-Circuit Emulators from Renesas and Midas Labs. Devices supporting trace can be combined with the Green Hills SuperTrace Probe to unleash full data and instruction trace capabilities, including a full integration with the TimeMachine Debugging Suite.